Getting started with a CAD-CAM product can sometimes be challenging when going about it on your own. Because CAD-CAM is such an important aspect of any shops CNC machining productivity, profitability and success we wanted to provide some assistance to help you get started. While these 5 elements are not everything, they are important and if followed, your shop will be well on its way to achieving improved productivity in CNC programming with less down time due to implementation challenges. 5 Ways To Make CAD/CAM Implementation Easy from BobCAD-CAM, Inc. When implementing a CAD-CAM product it is very good to know your machines in terms of what they can do, the make and model of the CNC controllers and what their G-Code looks like. The reason for this is simple as it affects what features you should be asking for in the CNC CAD-CAM software your looking at as well as if there are available Post Processors for the machines on your shop floor. Print out a sample G-Code program and give it to your CAD-CAM provider along with any other machine information so that they can help you with providing accurate post processor data ahead of time. This way when you instal the CAD-CAM software you will already be set with the post processors you need in order to start programming parts. This will ensure a smooth implementation and transition into machining your parts. 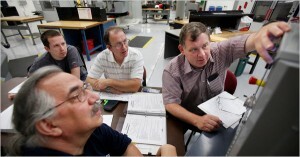 It’s important to get your staff involved in the process of choosing a CAD/CAM product. Your CNC programmer, Machinist and all staff that will be a part of the CAD/CAM implementation process. This is good for morale and ensures that any personal preferences in CAD-CAM are brought out into the open before money is spent on a product. A great way to do this is to ask your CAD-CAM provider to give a “Live” demo over the internet with your programmer present so that they can ask questions and get comfortable with what the CAD-CAM software can do and how it’s done. After all, they are the staff that will be using it. Involve your CNC programmer and/or CNC machinist into the process so that they can achieve the success you want faster. Vender demo technicians should be available every day to step you through the software and what it can do to enhance your shops CNC programming success. Just as Process Planning is a backbone of your shops successful productivity, planning for the use of CAD-CAM is critical. What type of CNC applications do you run now and what type of jobs are you planning to do for the future? With these answers in mind, find a CAD-CAM product that will fulfill your current and future needs. Modular CAD-CAM will allow you to buy technology and upgrade later as you need to. Most successful machine shops have more than one CAD-CAM product as well because needs change in a Job Shop environment and not all CAD-CAM products are modular. 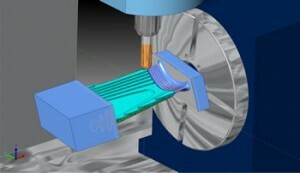 Therefore, shops end up with several CAD-CAM systems where modular CAD-CAM is the answer. It’s important to plan and go with a CAD-CAM provider that offers modular products so that you can acquire what you need now and add on higher level machining technology as your shop grows. This will prevent limiting yourself and ending up with several CAD-CAM products later. In fact, small shops on tight budgets for technology-software will benefit from this the most because they will be able to afford what they need now and grow as they purchase more CNC machinery. With modular software, you won’t end up paying more when you don’t have to. Ensure that Professional Certification is made available and can be issued for completing training classes and/or seminars. Most CAD-CAM providers have multiple ways to become a certified operator of their products. The more options the better as this gives more flexibility. For a small investment compared to the cost of potential lost productivity or machine down time due to lack of support, you can ensure that you have help when you need it. Make sure that you have a technical support contract or membership associated with your new CAD-CAM product. Make sure that your CNC programming staff have access to your CAD-CAM providers technical support team from the start of implementing your CAD-CAM product to ensure that you have the support and help available. Established CAD-CAM providers will generally offer every customer with multi-level technical support options that ensures that customers get the help they need when they need it. These 5 points will certainly help you to achieve a smooth CAD-CAM implementation process for your business!